What Is The Cocoon Wellness Pro RED Pod? Cocoon Wellness Pro RED is the newest most technologically advanced wellness pod. It delivers wellness and fitness benefits for optimized whole body health- whether it be weight management and weight loss goals, firming and toning, improved endurance and physical fitness, pain relief, enhanced mental acuity and focus, or relaxing and stress reduction. 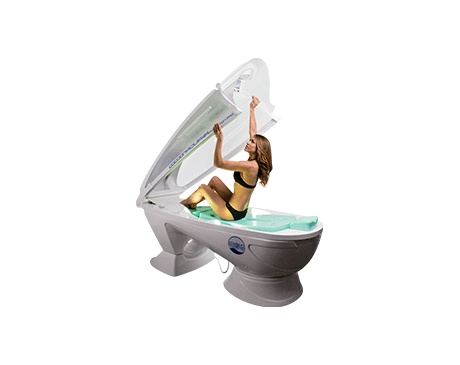 A personalized total body, dual wave vibration massage system with infrared heat, red chromolight therapy, and radiant heat are combined in this capsule for ultimate relaxation, fitness and wellness benefits. Depending on individual goals a customized treatment plan can be determined at time of visit. For best results multiple treatments are recommended. You can wear work out clothing, a swim suit, or undergarments. A trained professional will instruct you on the best clothing option depending on your desired result. How long am I in the pod? The sessions range from 15-30 minutes and can be customized to your preference.